This report covers a seven day trip to the Harzer Schmalspurbahnen, a 140km network of metre gauge lines in the Harz Mountains in western Sachsen-Anhalt, close to the former East-West German border. The railway was part of the Deutsche Reichsbahn system at reunification and quickly became a tourist attraction, not least because it was still largely steam worked. The line soon passed into the ownership of a consortium of local authorities and has been developed in a sympathetic way since, retaining its steam locomotives and character in the process. Harzer Schmalspurbahnen steam operations are centred on the route from Drei Annen Hohne and Schierke to the summit of the Brocken, the highest mountain in northern Germany at 1141m above sea level. Although there's a decent road to the summit, it's use is restricted and visitors have to leave their vehicles behind and walk or take the train to the top. It's no tedious trundle through the woods. The 2-10-2 tanks have to work hard to drag packed seven or eight coach trains up the almost continuous 1 in 30 gradient and there's lots of noise and exhaust to prove it. 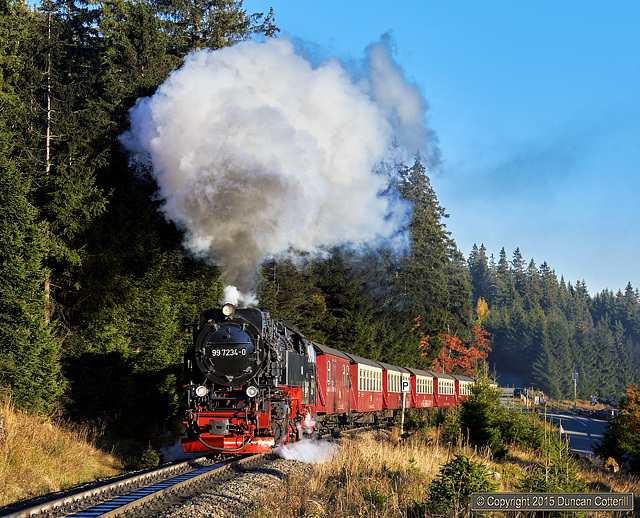 99.236 pounded up the grade above Schierke with train 8937, the 14:55 from Wernigerode to Brocken, on 11 October 2015. The loco carried the pre-computerisation number it would have had until the 1970s. The Harz Mountains were difficult terrain for 19th Century railway builders, making the choice of metre gauge for the Harz lines entirely logical. Wernigerode was linked to Nordhausen by the 60km Harzquerbahn, opened in stages between 1897 and 1899 by the Nordhausen - Wernigerode Eisenbahn (NWE). 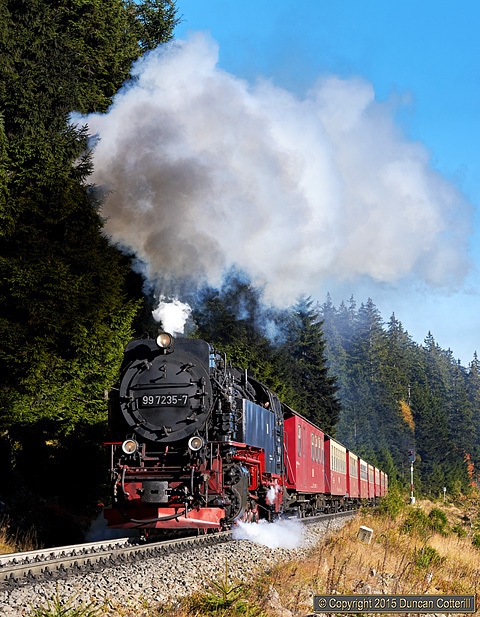 Even in Victorian times the Brocken was a big draw for tourists and the 19km Brockenbahn, the branch from Drei Annen Hohne to the top of the mountain, was opened in 1899 on the same day as the last section of the Harzquerbahn. The Harz lines abound in sharp curves and steep gradients as they wend their way over the hills and through the valleys of the region. The Harzquerbahn follows a rollercoaster profile, climbing over four significant summits between Wernigerode and Nordhausen on gradients as steep as 1 in 30. The Brockenbahn is just as steep but the gradient is virtually continuous in one direction. Brocken station, at 1125 metres above sea level, is the highest station on an adhesion worked line in Germany and 582m above Drei Annen Hohne, giving an average gradient of 1 in 32.6! After WWII the NWE found itself in the Russian zone, later the Deutsche Demokratische Republic or DDR, and the company was absorbed into the Deutsche Reichsbahn in 1949. The Harzquerbahn and Brockenbahn were on the front line between East and West and in 1952, as tensions rose, Schierke, Elend, Sorge and Tanne stations were included in the Sperrgebiet, the forbidden zone immediately to the east of the border, out of bounds to the general public without a special permit. The line ran within a few metres of the border fence north of Sorge and armed soldiers rode the trains to make sure nobody got off where they weren't supposed to or otherwise misbehaved. The Brocken was also in the Sperrgebiet but permits were issued to hikers and passenger trains continued to run until 1961. They ceased abruptly on 14 August, a day after the building of the Berlin wall commenced. After that, the Brocken was strictly out of bounds, closing the line above Schierke to passenger traffic. The East Germans and Russians each built a listening post on the summit to intercept NATO communications and a high concrete wall was built around the installations at the top, including the railway station. Freight trains continued to carry supplies to the Brocken garrison until 1987 and the line above Schierke officially closed at the end of 1988. Ironically, many of the military access roads used to patrol the border and Sperrgebiet became public footpaths after the end of the Cold War, making it much easier for people to go where they hadn't been allowed for many years. After reunification DR geared up for merger with DB and the metre gauge lines in the Harz didn't really fit into their plans. Fortunately the tourist authorities realised how important the railways were to tourism in the region and in 1993 the Harzquerbahn, Brockenbahn and Selketalbahn passed into the ownership of Harzer Schmalspurbahnen GmbH, itself owned by a consortium of local authorities. The HSB refurbished and reopened the Brockenbahn above Schierke in 1992 and has spent significant amounts improving the infrastructure of the rest of the system since. For most of the DDR years the Harzquerbahn was the main line of the Harz system but the focus has shifted since reunification and the central section, from Drei Annen Hohne to Eisfelder Talmühle, is now one of the least heavily trafficked parts of the whole network. In contrast, the Brockenbahn, a backwater in DR days, has become very busy with as many as 12 trains each way a day in the summer season. 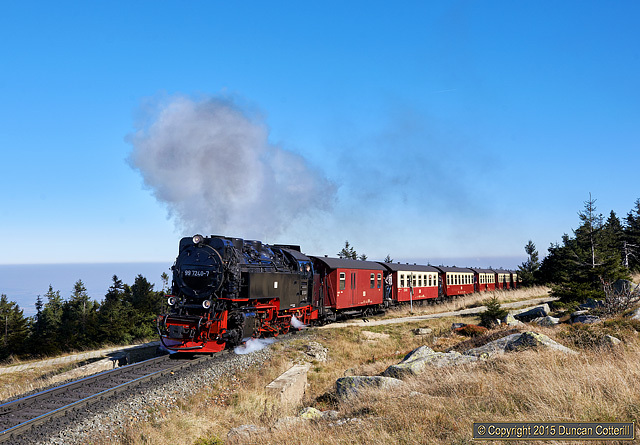 The Brocken operation was intense during our visit with trains running between Drei Annen Hohne and the summit of the Brocken at intervals of 45 minutes to an hour for much of the day. Over half the trains started from Wernigerode with one train a day coming from Nordhausen. Most services consisted of seven coaches hauled by one of the railway's fleet of 2-10-2 tanks and many were very well loaded, particularly above Schierke. Some weekend trains were noted with eight coaches, all packed. The locos were worked hard on the steep gradients with towering exhausts and sound effects to match. In addition to the Brocken trains, one daily steam hauled service operated from Wernigerode to Eisfelder Talmuhle on the Nordhausen line. This train was formed of stock plastered with advertising for the local hooch and an open wagon for those foolish enough to pay for the privilege of risking hypothermia. Needless to say, we didn't make much of an effort to photograph it. There were also couple of railcar workings to Eisfelder Talmühle, providing early morning and evening services. More railcars provide services south of Eisfelder Talmühle, although we didn’t see any of them, and there are also bi-mode trams running in diesel mode on the HSB line between Ilfeld and Nordhausen. 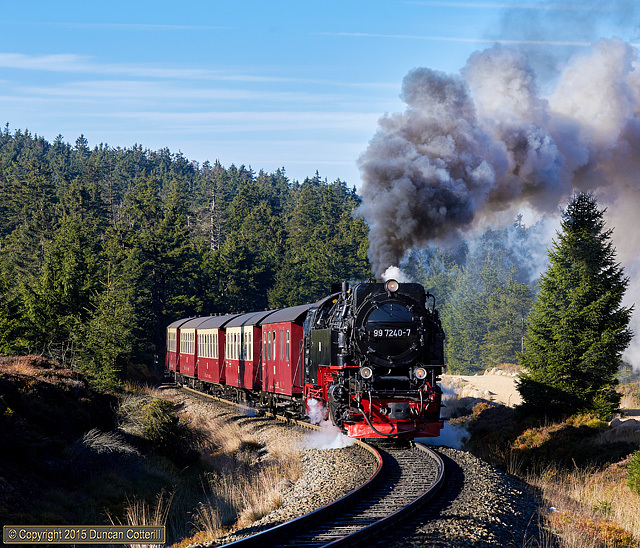 On Wednesdays and Saturdays there was an additional premium fare train, the “Traditionszug”, formed of vintage coaches and hauled from Wernigerode to Brocken and back by one of the line’s older locos. 99.7234 had just crossed the road to the summit and passed the 800 metres above sea level marker when it was photographed working train 8945 up the hill from Schierke on 11 October 2015. The 16:47 from Drei Annen Hohne to Brocken would soon pass the site of Eckerloch station, built in 1950 to give access to a nearby ski jump during that year's German Winter Sports Championships. The station officially closed three years later after the Brocken became a restricted area but was only used by passengers for the four days of the 1950 event. The only way to get a picture of the first train of the day near the top of the Brocken is to climb the mountain on foot. We reached this shot in the saddle between the Königsberg and the Brocken after walking for about an hour from the car park at Ehrenfriedhof on the Braunlage to Bad Harzburg road, crossing the old border on the way. 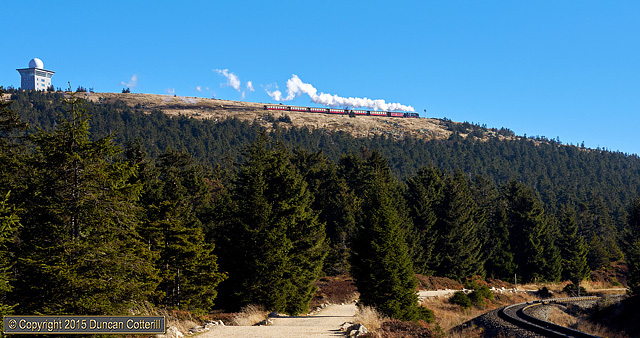 99.7240 worked train 8931, the 08:55 from Wernigerode, towards the summit on 12 October 2015. The final section of the line up the Brocken is in the form of a spiral with the line circling the summit one and a half times. 99.7240 was photographed around 1km from the top, working train 8941, the 12:00 from Drei Annen Hohne, around the spiral on 12 October 2015. On the left, there's a view down onto the plains, shrouded in haze. During the Cold War the summit of the Brocken was home to Soviet and East German listening posts and surrounded by a massive concrete wall. Since then the wall and many of the buildings have been demolished with the remainder being converted to cater for visitors. One of the observation posts, now part of the hotel, can be seen top left of this picture of 99.7240 approaching the summit with the first train of the day on 12 October 2015. The motive power situation has changed over the years but not as much as might be expected. The Nordhausen Wernigerode Eisenbahn started operations in 1897 with four 0-4-4-0T Mallets and a number of smaller engines. By 1901 there were 12 Mallets on the roster but six of them were called up for military service in 1914 and remained in France after the war ended. Five of the remaining six survived into DR days and three still exist today as 99.5901 to 99.5903. Another Mallet of a similar design was built for the army in 1918 and sold to the NWE after the war, eventually becoming 99.5906. Two 0-6-0Ts, again built for the army, were acquired at the same time and also survive as 99.6101 and 99.6102. Two larger Mallets, this time 2-4-4-2 tanks, were built for the NWE in 1922 and 1924 but weren't a great success. By the 1930s the railway was starting to think about replacing its earlier Mallets and plans were drawn up in conjunction with the other metre gauge lines in the Harz for modern 2-6-2T, 2-8-2T and 2-10-2T locomotives. The prototype 2-6-2T was delivered to the NWE in 1939 but the Second World War intervened before any more could be built. When the NWE was absorbed into DR in 1949, the 0-4-4-0T Mallets were still the mainstay of the fleet and the 2-6-2T, which became 99.6001, was the only modern locomotive on the railway. New locomotives for the metre gauge lines weren't DR's highest priority and it was 1955 before the first of the standard 2-10-2 tanks entered service. These were based on a class of three locos built in 1931 for the Eisfeld - Schönbrunn line in Thüringen, rather than the NWE's pre-war design. They were big engines and problems were experienced on sharp curves, requiring considerable modification before they were considered satisfactory performers. The new machines allowed the replacement of the older Mallets but, instead of going for scrap, the old locos were transferred to the Selketalbahn for another 30 years of front line service. By 1957 Wernigerode had 11 of the 17 DR standard 2-10-2Ts, another two came from the Gera - Meuselwitz - Wuitz line in 1958 and 1960 and the final four from Eisfeld in 1973 and 1974. The only survivor of the pre-war class of three 2-10-2Ts on which the post war engines were based, 99.222, had been transferred from Eisfeld to Wernigerode in 1966. The other two members of this class had been shipped to Norway during the war and remained there afterwards. Most of the ex-NWE engines that remained on the Harzquerbahn were withdrawn and scrapped in the 1960s, including the 2-4-4-2T Mallets. By the 1980s dieselisation was on the agenda and at the end of 1988 the first of a planned 30 class 1998 diesels, regauged DR class 110 centre-cab locos, arrived at Wernigerode. Although they were technically successful, the new diesels were very unpopular with the tourists, even in DDR days, and that, together with the political upheaval that followed the opening of the border, resulted in only ten diesels being converted and their use on passenger trains limited. A couple of small diesel shunters were also acquired during the 1980s. The NWE had three diesel railcars, all built in the 1930s. Two were scrapped in the 1960s but the third was used as a departmental vehicle from 1968 until 1980 then withdrawn. It was resurrected in 1983 as a historical vehicle for use on special trains. When the HSB took over, this railcar and another from the Selketalbahn, also a preserved 1930s vehicle, were the only railcars on the system. Three 1950s built railcars were bought from the Inselbahn Langeoog in 1995 and they were joined by a brand new railcar in early 1996. The units were used on lightly loaded services, particularly on the Selketalbahn, where the use of a loco and coaches was uneconomic. Another four new railcars, to a different design, were bought in 1999 when additional services were introduced between Nordhausen and Ilfeld. the two class 9961 1914 built 0-6-0T - 99.6101 / 6102. 99.5903, 99.7231 / 7233 / 7242 / 7244 / 7246 are thought to be in store at various locations on the system. The other 0-4-4-0T Mallets, 99.5904 / 5905, were scrapped in DR days. 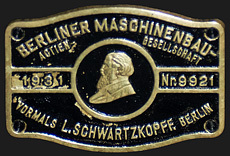 It's remarkable that in almost 120 years since the first section of the Harzquerbahn opened, most trains have been handled by locomotives of only two types, the 0-4-4-0T Mallets dating from 1897 that were the principal power until the mid 1950s and the 2-10-2Ts that took over from them and have handled most trains since. Although considered modern engines, the big tanks are around 60 years old and based on a design that's 85 years old. Most of the active fleet have been fitted with new frames and cylinders since 2004, ensuring that they'll be fit for many more years service. Only three of the ten class 1998 diesels are still in service - 199.861 / 872 / 874. One is normally used on ECS duties at Wernigerode and one or two more are based at Nordhausen for use on freight traffic, primarily stone from the quarry at Unterberg, near Eisfelder Talmühle. A number of the others have been sold and converted back to standard gauge. A total of nine different standard 2-10-2Ts were seen on the Wernigerode - Nordhausen / Brocken section during our visit, plus pre-war 99.222 which was being used turn about with the post-war engines. Six locos were required each day to work the summer service, five starting from Wernigerode and one from Nordhausen. There was a regular pattern to loco workings during the day but there didn't seem to be any pattern from one day to the next, except in the case of the Nordhausen based duty. 99.7245 was the regular Nordhausen loco and usually covered all the steam workings south of Drei Annen Hohne, swapping trains there with locos working between Wernigerode and Brocken. The loco allocated to this duty can sometimes be turned at Nordhausen and can face in either direction, while the others are consistently chimney first leaving Wernigerode. 99.7235 took over the Nordhausen duty for a couple of days when 99.7245 required a visit to Westerntor Works, swapping duties by not exchanging trains at Drei Annen Hohne on the Wednesday and the Friday. 99.222 and 99.236 were running with pre-computerisation style numberplates, the others, including 99.5901 had computerised numbers with check digits. Mallet 99.5901, now almost 120 years old, was seen on a special train on the Wednesday and was probably used on the "Traditionszug" on the Saturday as it was cooling down on Wernigerode shed on the Sunday. Between trips it seemed to return to the workshops at Westerntor. The Wednesday "Traditionszug" was worked by 99.222. The only other steam loco seen was 99.6101, tucked away at the back of Wernigerode shed but not in steam. The only railcars seen working were those on the early and late turns between Wernigerode and Eisfelder Talmühle, always members of the 1999 batch. 187.001, the railcar built in 1933 for the Selketalbahn, was in the shed at Wernigerode but didn't move while we were there. 99.5906 was one of seven 0-4-4-0T Mallets built by Maschinenfabrik Gesellschaft Karlsruhe for the German army in 1918. The design was based on a batch of Albtalbahn locos that were similar to, but not the same as, the NWE Mallets. The army sold the locos in 1920 with one going to the NWE as their No.41, renumbered by DR to 99.5906. The loco is usually based at Gernrode for use on the Selketalbahn and often works service trains on days when two locos are required. Two more Mallets, 99.5901 and 99.5902 are based at Wernigerode but rarely work service trains. 99.6001 was the first of a series of 2-6-2, 2-8-2 and 2-10-2 tank locomotives that were intended to modernise the NWE's locomotive fleet and those of the neighbouring metre gauge lines, the GHE and SHE. The loco was completed by Krupp in 1939 but WWII intervened before any more could be built. Attempts to procure similar locos during and after the war came to nothing. This small but deceptively powerful engine is usually based at Gernrode and is regularly used to work service trains on the Selketalbahn. 99.222 was one of three 2-10-2Ts built for DR's Eisfeld - Schönbrunn line by Berliner Maschinenbau AG in 1931. They were intended to be the first of a standard type to replace older locos on several DR metre gauge lines but no more were built. The other two locos were sent to Norway in 1944 and scrapped there in the 1950s. 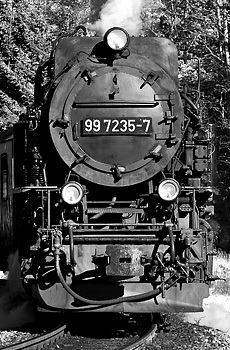 99.222 remained in Germany and moved to the Harz in 1966. 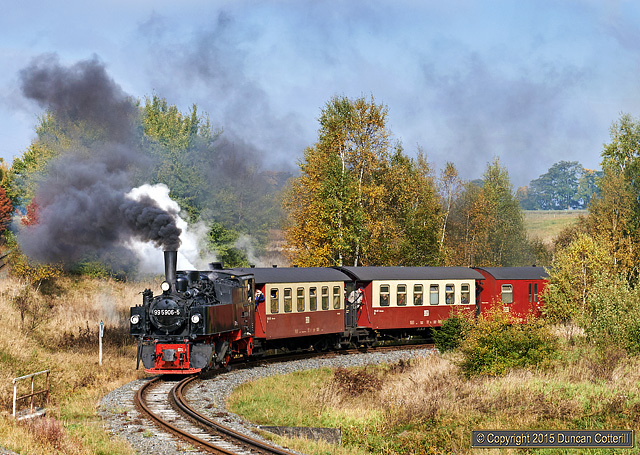 The loco is usually based at Wernigerode and can often be found working service trains to the Brocken, turn about with the newer 2-10-2Ts. It's also a favourite for special trains. 99.236 is one of 17 standard 2-10-2Ts built for DR by Lokomotivbau Karl Marx in Babelsberg between 1954 and 1956. The design was based on the three 2-10-2Ts built in 1931 for DR. All 17 locos were based at Wernigerode by 1974 and all 17 are still owned by the HSB, although around five are currently in store. 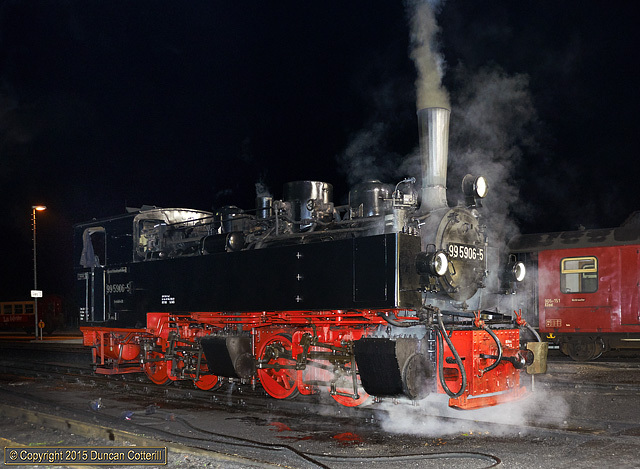 These locos are the mainstay of steam operations on the HSB and work most steam services on the Harzquerbahn and Brockenbahn. They can sometimes be found on the Selketalbahn as well. Unlike 99.236 most carry computerised numbers in the 99.72XX series. The Selketalbahn predates the rest of the Harz metre gauge system by about ten years and is named after the valley the line follows for over 20km from Mägdesprung to beyond Albrechtshaus. In the late 19th Century the area was a hive of industry with the mining of various minerals and metal ores, metal refining, metalworking and gunpowder manufacture, all carried out in the valley of the Selke. The first section of the Gernrode - Harzgerode Eisenbahn (GHE), from Gernrode to Mägdesprung, opened in 1887 and it reached Harzgerode the following year and Hasselfelde in 1892. The connection from Stiege to Eisfelder Talmühle on the Harzquerbahn was completed in 1905. Although the Selketalbahn gives the impression of running through easier country than the other Harz lines, the ruling gradient is actually steeper, reaching 1 in 27 on the climb from Eisfelder Talmühle towards Birkenmoor and 1 in 25 on the climb from from Mägdesprung to Sternhaus-Ramberg. In 1949 the GHE was absorbed into the Deutsche Reichsbahn but there wasn't much to absorb. The Russians had dismantled most of the railway in 1946 and taken everything back to the USSR, track, signalling, locos, rolling stock, everything! Fortunately the mine at Straßberg, then known as Lindenberg, was the DDR's principal source of Fluorospar, an important industrial mineral, and the line from Gernrode was rebuilt during 1949. The Harzgerode branch was restored in 1950 but it was 1984 before the section from Straßberg to Stiege returned to service. The line from Eisfelder Talmühle through Stiege to Hasselfelde had remained in use throughout, operated as a branch off the Harzquerbahn. As well as rebuilding the line from Straßburg, a new turnback loop was laid at Stiege, allowing freights to run through from Eisfelder Talmühle to Straßberg without running round. The final section of today's Selketalbahn was added in 2006, when the line was extended 9km from Gernrode to Quedlinburg over the trackbed of the former standard gauge branch that closed in 2004. The GHE didn't have a lot of luck with its locomotives. It started with five 0-6-0 tanks, added three 0-4-4-0T Mallets in 1905 and an 0-8-0T in 1910. The Mallets went to the Western Front in 1914 and never came back, spending the rest of their days on minor lines in eastern France. Two 0-10-0 tanks were acquired in 1928 but they were taken as reparations by the USSR in 1946, along with all the other GHE locos except for one of the 0-6-0 tanks. The story goes that the loco had been used to load the last of the equipment to be taken as reparations onto standard gauge wagons at Gernrode when a Russian soldier set it in motion, accidentally or otherwise, while the crew were having a break. As a result it derailed and suffered damage to the motion. With no means of recovering the loco easily, the Russians left it behind. The last GHE engine, the unnumbered "Gernrode", became DR's 99.5811 and survived into the 1960s before being scrapped. The GHE also had a diesel railcar but a fuel shortage during WWII caused the unit to be put into store at Eisfelder Talmühle and somehow forgotten. It was missed when an inventory of stock to be taken to the USSR was drawn up and remained in Germany, eventually becoming the HSB's 187.001. In the years following the reopening of the lines to Straßberg and Harzgerode, the Selketalbahn was operated by the railcar and just two locos, 99.5811 and another small engine borrowed from Wernigerode. By the mid 1950s the Harzquerbahn had received a number of new 2-10-2 tanks, freeing up three ex NWE 0-4-4-0T Mallets for transfer to the Selketalbahn in 1956. The remaining Mallets were transferred to the Selketal within a few years followed by 2-6-2T 99.6001 in the mid 1960s. Following the reinstatement of the link between Straßberg and Stiege and the introduction of regauged V100 diesels, spare 2-10-2Ts were drafted in to replace the Mallets on the Selketalbahn. When the line transferred from DR to the new Harzer Schmalspurbahnen in 1993, the 2-6-2T, 99.6001, was the only small engine in regular service and the 2-10-2Ts worked most trains. Since then many services have been taken over by single-unit railcars acquired new or second-hand by HSB in the 1990s. One daily steam diagram remains, covering virtually the whole system during the course of the day. On Thursdays, Fridays and Saturdays in summer one of the railcar diagrams is operated by a steam loco and coaches instead. The second turn also covers most of the system during the day, including the only section that the first turn misses out, the Stiege loop. It misses out the 5km section from Stiege to Hasselfelde though. We had expected the daily diagram to be covered by 2-6-2T 99.6001 and hoped that 0-4-4-0T Mallet 99.5906 would be on the three days a week trains but a visit to the line on the Thursday found 2-10-2T 99.7243 on the daily trains and 99.6001 on the Thu - Sat services. There were no other locos in the shed at Gernrode. 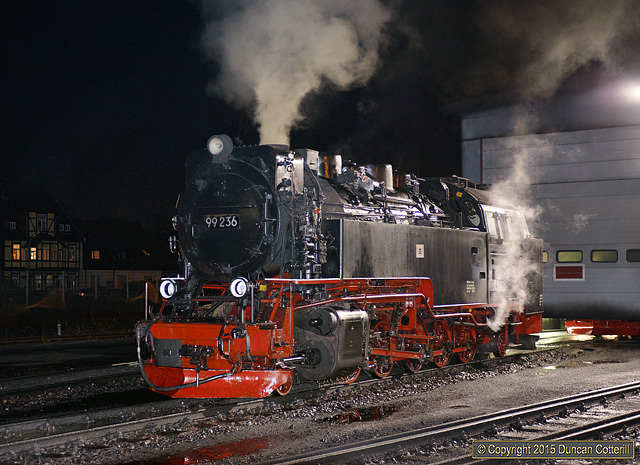 On Thursday night 99.5906 was in steam on shed at Wernigerode and left light engine for the south on Friday afternoon. It arrived at Gernrode on Friday evening with five coaches in tow, which it had probably picked up at Eisfelder Talmühle. On the Saturday 99.5906 and 99.6001 were on their expected duties while 99.7243 worked a special from Gernrode to Brocken and back using the five coaches the Mallet had brought in the previous evening. Much to our surprise, 99.7243 was back on the daily turn on the Sunday. All three locos were facing the usual way round, chimney first out of Quedlinburg with 99.6001 the only one to carry pre-computerisation numbers. The only railcars seen in use were from the 187.016 to 187.019 batch, built in 1999. One of the ex Langenoog 1955 built units, 187.013, was in the shed at Gernrode but didn't move during our visit. 99.5906 negotiated the turnback loop at Stiege with train 8951, the 08:30 from Quedlinburg to Eisfelder Talmühle, on 10 October 2015. The line to Hasselfelde can just be seen disappearing on the extreme left. 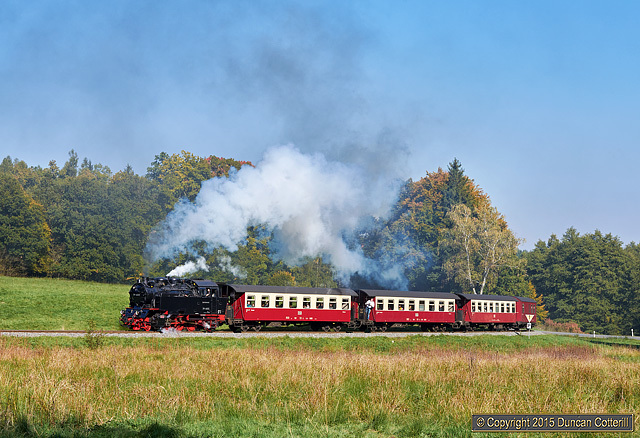 This train, which is steam worked on Thursdays, Fridays and Saturdays in summer, connects with the steam worked service from Nordhausen to the Brocken at Eisfelder Talmühle. 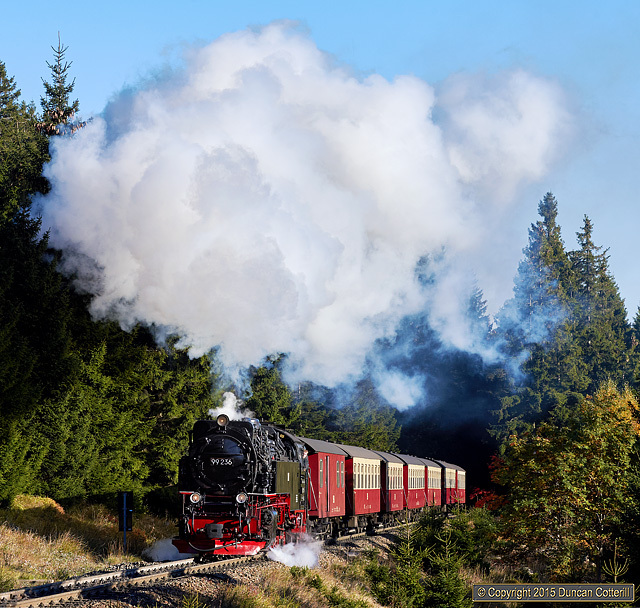 When it runs, it's possible to travel from Quedlinburg to the Brocken and back in a day, steam hauled all the way, a total of 202 km. The HSB line from Gernrode to Quedlinburg opened in 2006 and uses the trackbed of the standard gauge line closed in 2004. 99.5906 shuffled along through open countryside between Bad Suderode and Gernrode with train 8953, the 13:40 from Quedlinburg to Gernrode, on 10 October 2015. 99.6001 climbed away from Sternhaus-Haferfeld with train 8965, the 13:57 from Gernrode to Hasselfelde, on 10 October 2015. 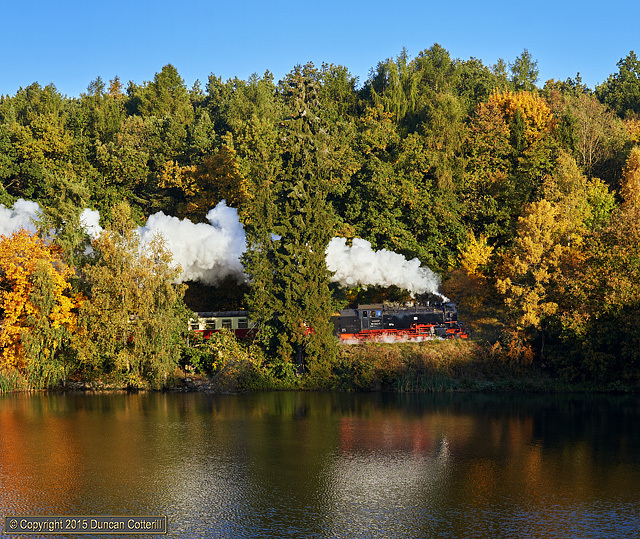 We had fully expected 99.6001 to work the daily Selketalbahn steam diagram on Sunday 11 October but the first train of the day, the 07:34 from Gernrode to Harzgerode, turned up with 99.7243 on the front. While a little 2-6-2T would have fitted neatly into the gap between the trees, a big 2-10-2T was a different matter. In the event, there was just enough room but in the next frame, taken 1/5 of a second later, the snowplough was in shadow. The location is less than a kilometre below Harzgerode on the short, steeply graded branch from Alexisbad. Our first three days in the Harz were dull, wet and rather too warm for good steam photography. We used the time productively though, checking out photo positions to see which were overgrown and which were clear, checking which stock was being used on which service, which locos were working and which way they were facing. All very frustrating but essential preparation for when, or if, the sun came out. 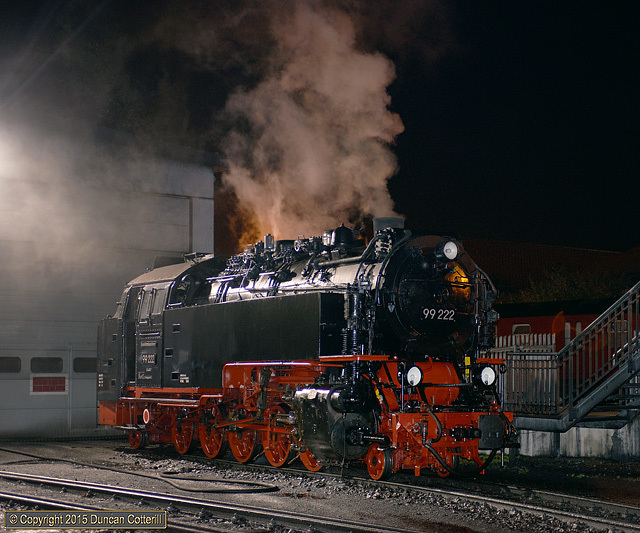 The only worthwhile shots were those taken at Wernigerode shed at night or when the light was so bad that it started to get interesting. It was day four, the Saturday, before the temperature dropped and the sun came out, somewhat reluctantly at first, but by late morning the sky was largely clear. This was a stroke of luck as it was the only day of the trip when 99.5906 worked service trains on the Selketalbahn. The day was spent following the Mallet and 99.6001 up and down the line, concentrating on the Mallet of course. There aren't many good photo locations but they are all easily accessible from the road and the trains are very slow, almost slow enough to make chasing by bicycle a practical possibility. The sunshine was unbroken on the Sunday, appropriately enough, but neither of the small engines were out on the Selketalbahn and the steam turn was being covered by 99.7243. We moved to the Harzquerbahn after one shot and picked up bunker-first 99.7245 on the Nordhausen - Brocken train north of Ilfeld before continuing to Drei Annen Hohne and then climbing above Schierke in the afternoon. Monday was the big day and we set off early to Ehrenfriedhof, north of Oderbrück on the Braunlage to Bad Harzburg road. The car park there is just over 800m above sea level and as close to the Brocken summit as it's possible to get by road, both horizontally and vertically. We'd allowed around two hours to get into position for the first train of the day but the 5km walk to the saddle between the Brocken and Königsberg only took an hour. This was despite a vertical climb of around 200m, most of it within a single kilometre on the ramp from the Cold War border up to the lineside at Goetheweg siding. The same climb was rather treacherous in winter with ice everywhere but much easier this time. Arriving early left us to find somewhere to shelter from the bitterly cold wind for an hour until the train appeared. The cloud stayed away until mid-afternoon and we spent the day around the summit, photographing each successive arrival. With the cloud thickening and the light moving round so the exhaust blew down on the sunny side, we called it a day and started our descent before the last uphill train appeared, arriving back at the car before it got dark. Tuesday dawned very cold and completely overcast and stayed that way all day. We hung around until early afternoon but there were no signs of the weather improving, so we headed back to Hannover for our flights home. 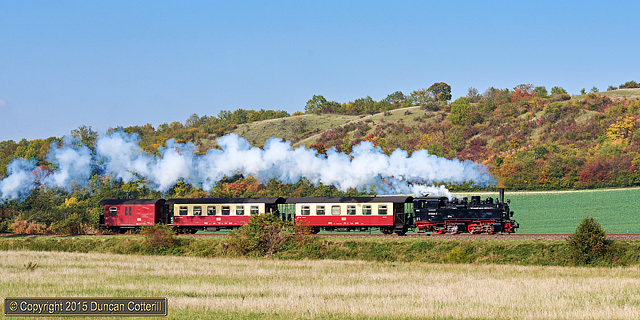 The HSB's 2-10-2 tanks have to work hard to drag their trains to the top of the Brocken but give the impression of taking it all in their stride. 99.7235 had eight coaches hanging on the drawbar as it climbed confidently from Schierke towards the summit with train 8923, the 15:06 from Drei Annen Hohne to Brocken on 11 October 2015. 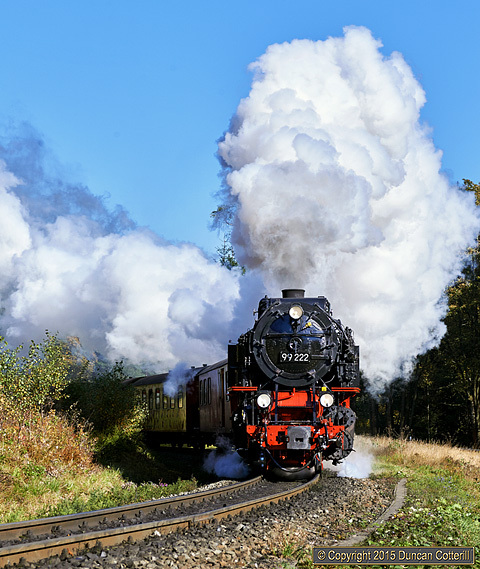 99.222 was working the days most demanding diagram on 11 October 2015, involving two return trips from Wernigerode to Brocken and a fill in trip from Brocken to Drei Annen Hohne and back as well. That's almost 8000 feet of vertical climb and, as it was a sunny weekend, the trains were particularly heavily loaded. Not bad for an 84 year old machine. We flew from the UK to Hannover and picked up our hire car there. The timing of flights from Birmingham and Manchester isn't ideal and makes it necessary to spend a night in the Hannover area before continuing to the Harz the following morning. There's more choice if flying from London. The journey from Langenhagen, close to the airport, to Wernigerode would have taken around 80 minutes if we hadn't run into one of Germany's legendary traffic jams near Braunschweig. As it was, we just missed the day's first train leaving Wernigerode, hardly a problem in the dull weather. Hotels used were the Basic in Langenhagen, rather better than it sounds, the Altora, opposite the HSB shed in Wernigerode, and the Gasthof zum Bären in Gernrode, about 1km south west of the station on the road towards Harzgerode. I'm not generally keen on tourist lines, most of which rapidly become gimmicky and lose the character of a real working railway. The Harz lines have managed to avoid that pitfall and have retained a lot of their character over the 22 years since the HSB took over. Comparing my photos from this trip with those I took in 1991 doesn't show too many differences. The engines and coaches are cleaner and in a better mechanical state and the track and stations look better cared for but that's about all. The locos and coaches carry the same livery and the HSB logo even looks like the DR logo when viewed at an oblique angle. The main difference is not on the railway itself but in the surrounding landscape. There seem to be far fewer open spaces than there used to be and the forest crowds in on the line from all sides. This makes it difficult to get pictures from any angle other than head on, limiting the photographic potential considerably. The Selketal suffers less from this than the other lines but it's still difficult finding clear shots. As an experience, a visit to the Harz is very worthwhile. The locos are worked hard and, apart from the Mallets, they've got a loud crisp bark that can be heard for ages before and after the passage of a train. The 2-10-2s also have gorgeous chime whistles that echo off the hillsides. There's no excuse for being taken by surprise by an uphill train unless you're stone deaf! If your preference is riding the trains then there are plenty of ticketing options. 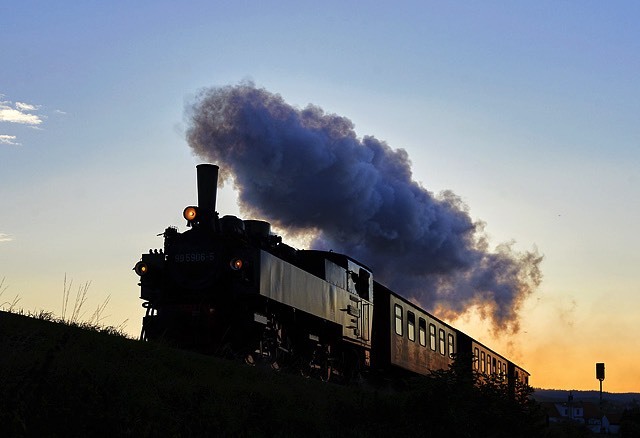 In the 2015 summer season a return from anywhere on the system to the Brocken cost €37, whether it was from Schierke, 14km away, or Quedlinburg, 101km away, and there were a number of railpass options, such as 3 and 5 day passes for the whole system at €74 and €111 respectively or, best value of all, a 3 day pass for the Selketalbahn at €17. Details of the timetables and fares can be found on the HSB's website some of it in English as well as German. There's an excellent German language book, or actually a pair of books, "Von der GHE zur HSB" by Dirk Endisch (ISBN 978-3-936897-70-0) covering the history of the HSB lines, locomotives and rolling stock in great detail and with plenty of illustrations, 480 pages in total. They're available from the HSB's shops at €19.95 for the pair and were the source of much of the historical information in this report. It became very apparent when researching the historical material that the timely intervention of events largely unconnected with the railways played a huge part in shaping the HSB's current locomotive fleet. The Mallets would have been scrapped in the early 1940s if the Second World War hadn't prevented the HSB buying new locomotives. They wouldn't have survived the 1950s if the HSB had been free to order new locos after the war or if the Russians hadn't stolen the Selketalbahn and they certainly wouldn't have survived the arrival of 30 regauged diesels in the early 1990s. It's doubtful whether the objections of the locals would have limited the use of diesels for very long and the entire steam fleet would have probably been retired by the mid 1990s if the DDR had still been in existence. By that time, even the post-war 2-10-2Ts would have been 40 years old. Just before the first diesels arrived, 99.222 then numbered 99.7222, was withdrawn with a cracked cylinder and could well have been scrapped as, in the railway management's view at least, steam was on the way out and it wasn't worth repairing. The re-opening the border came at just the right time for the whole fleet and for 99.222 in particular. With tourists flocking to the Harz, the loco was sent for repair in 1990 and returned to service with a replacement cylinder. Although the Second World War and the division of Europe that followed are usually viewed as entirely negative, as they were in almost all respects, they played a large part in ensuring the survival of the HSB's eclectic fleet of locomotives and probably the railway itself. 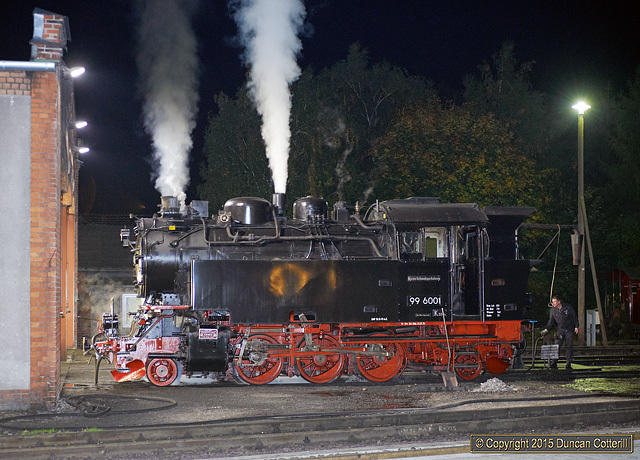 99.5906 shuffled up the bank between Bad Suderode and Gernrode shortly after sunset on 10 October 2015. The Mallet was on its way to Harzgerode with train 8957, the 17:53 from Quedlinburg.